I had been saving this particular species of tetrapod for my final blog post, and now that time has come. Recently I accepted an internship at the Center Of Science and Industry in Columbus, so I will be ending my work here at the Tetrapod Collection. As my time here comes to an end, I’d like to finish by writing about my favorite tetrapod species. 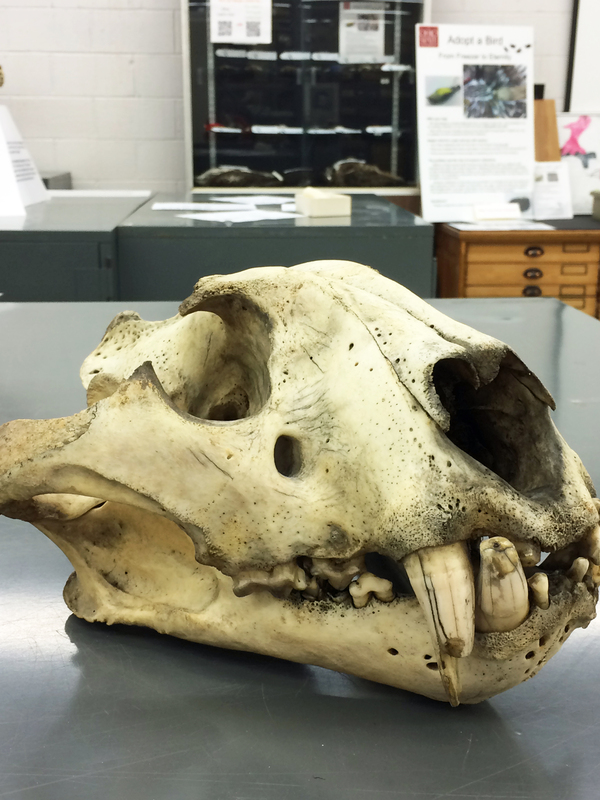 A tiger skull that we have here in the Tetrapod Collection. from two miles away. Tigers are known for their distinctive striped coats and, like our fingerprints, no two tigers have the same pattern of stripes. The tiger’s stripes are used to break up the tiger’s shape against the shadows of the mangrove forests in which they live. When tigers hunt, they will get in very close and use a quick fatal pounce to deliver a crushing bite to their prey. An adult tiger can eat up to 60 pounds of meat in one night, and will usually bury whatever it can’t finish in order to come back to it later. Tigers are fiercely territorial and unlike lions (who live and hunt in a large pride) tigers live, hunt, and rear offspring alone. Female tigers give birth to two to six cubs and raise them for two to three years before the young are kicked out and must find territory ranges of their own. To learn more facts about the Bengal Tiger, feel free to visit the National Geographic’s website. It pains me dearly to say that all subspecies of tiger are endangered. At the beginning of the 20th century there were eight subspecies, but they have now been reduced to five. There are many reasons for the tiger’s place on the endangered species list, the primary being poachers illegally selling the tiger’s body parts for use in Traditional Chinese Medicine. However, other threats such as habitat loss have also caused tiger numbers to shrink. Yet another reason for the reduction in tiger numbers has received some attention lately. Loss of prey items has always been a large concern in tiger population, but a new paper by Bhattarai et al (2012) explores a different aspect of this problem. In much of the range, tigers often live in the same habitat and compete for food with their cousin the Leopard (Panthera pardus). In India, this isn’t much of a problem because tigers like to hunt larger prey items while the leopards prefer to hunt smaller prey items. However, due to increased human activity in the area, larger prey species are vanishing which means that tigers now must resort to hunting prey species that the leopard would usually hunt. This lack of food will often cause the big cats to hunt livestock, which brings tigers and leopards into conflict with humans. The researchers stress that larger prey species must be protected to help the tigers and leopards go back to their normal feeding patterns so as to reduce inter-species competition and conflict with humans. Few other big cats come close to matching the tiger’s enormous strength and majestic beauty. None of the other species of big cat is as critically endangered as the tiger is and there are many projects currently underway attempting to increase, or even double the tiger’s population. Talks with the Indian government and a protected tiger pathway into neighboring Bhutan are among some of the ideas being discussed to help protect this beautiful animal. The World Wildlife Fund’s website lists several ways to action for you to help save tigers. Their struggle to survive in the modern world is reflected in the problems all endangered species face. So if we can save the Bengal Tiger, then there may be hope for other species teetering on the edge of existence. I’d like to say thank you to everyone who has read my posts. It has been a pleasure and an honor to expand this blog with fresh stories and new feature. I’d like to believe at my posts were educational and entertaining. 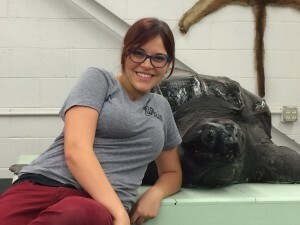 From here on out, OSU undergraduate and Tetrapod Volunteer Abby Miller, will be taking over as editor of the blog. May she entertain and enlighten you as much as hope that I have. Thank you. “Leopard, Leopard Pictures, Leopard Facts – National Geographic.” National Geographic. Bhattarai, B. P., Kindlmann P. 2012 Interactions between Bengal Tiger (Panthera tigris) and Leopard (Panthera pardus): Implications for Their Conservation. Biodiversity and Conservation 21, 2075-2094. While reading our “Meet the Staff” post, you probably saw that the term “geo-referencing” came up a number of times. What does geo-referencing mean and what purpose does it serve in a museum? It’s a fair question since geo-referencing isn’t exactly an everyday activity, yet it plays an important role in the digitization of our collection. Here’s the scenario: you’re sitting at home and hear a very loud smack. You go to see what happened, and find a bird has slammed right into your window. The bird is dead but you know a place where it can live on forever, the Museum of Biological Diversity’s Tetrapod Collection. You put the body in a freezer bag and take it over to the collection in order to donate it. This is known as salvaging and the whole process begins with that one action. 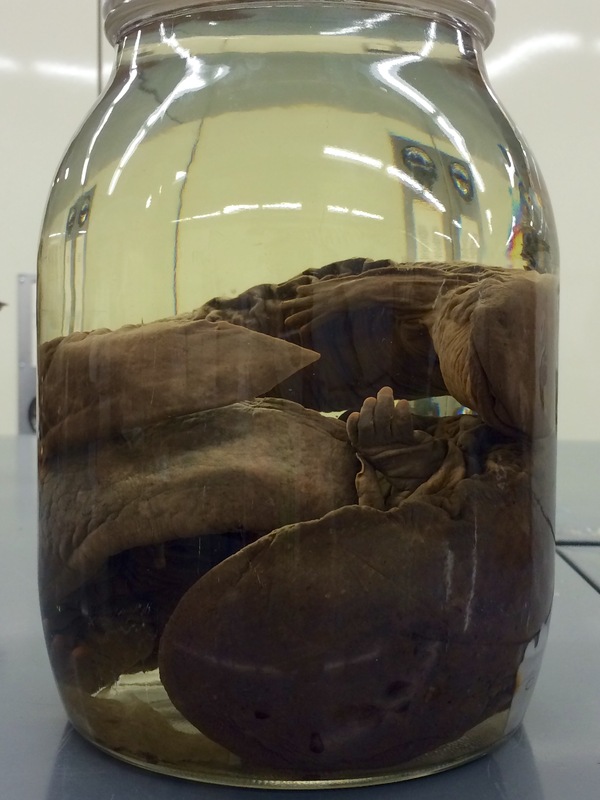 If you have more questions there is a whole webpage devoted to the contribution of specimens to the Tetrapod Collection. 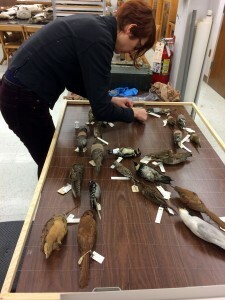 After our preparation lab assistants prepare a bird, it is given a label, a number, and is entered into the database. In the database we enter in the name of the collector, when it was collected, the species name, and the location. However, we can’t simply just put an address in for the location, we need to be much more thorough than that. We use latitude and longitude in order to map out points where our specimens were found. It helps build a species list of an area and maintain consistency when landmarks are removed or names are changed. In short, it reduces the uncertainty of a location. Having a specimen with latitude and longitudinal points clears up some of the following questions: For instance, a bird crashed into your window. What side of the house did the bird hit? Was it the north side, or was it the east side? How far from the house was it? Two feet? Maybe three? Sometimes a person can’t really give us information that is too specific, but we can still work with a general location given with a specimen. We’ll simply find the area that the specimen was found so we can use varying degrees of uncertainty that depend on the specificity of the locality provided. Geo-referencing is a common practice among scientists and research collections such as ours. Thanks to modern technology, we now have the ability to more accurately map out the presence of a particular species and assess the population’s health with more certainty. There are many times when scientific discoveries or conservation efforts rely on citizen scientists such as you making an interest in what we as a scientific institution do. Contributing a deceased specimen to a museum like ours counts as one of those times. As a university museum, we get a fair amount of artists in the Tetrapod Collection who will come to borrow specimens for uses beyond science. Sometimes an artist will borrow specimens and create a beautiful masterpiece that has a message behind it. Ohio State associate art professor, Amy Youngs, is undertaking a massive project that, once completed, is sure to turn heads and get people talking. Using the vast resource of dead birds from our collection, she has displayed many of our bird skins on a specially designed frame to spell out the word “STRIKE” in an elaborate, yet macabre, fashion. She then plans to hang the unique piece of art in the second floor windows of Hopkins Hall, as a reminder of the dangers windows can pose to birds. This particular art project is the result of a much larger undertaking called the Biopresence Project. This project involves collaboration of many departments at OSU such as art, engineering, and science. The point of the project is to foster a greater appreciation for the biodiversity of our local ecology and start dialogue on how we can make room for animals in our modern world. People all over the campus are encouraged to document when they see any kind of animal and report it through social media (Twitter, Tumblr or Instagram) using the hastag #AnimalOSU. According to Professor Youngs, the Biopresence Project inspired her to create the window strike piece. “I’ve been working on the Biopresence Project with Dr. Nelson for about a year,” said Professor Youngs. “This idea came out of some of the things I’ve learned working with her [Dr. Nelson] and working with some of the other people in the project.” To learn more about the Biopresence Project, you can visit their website. 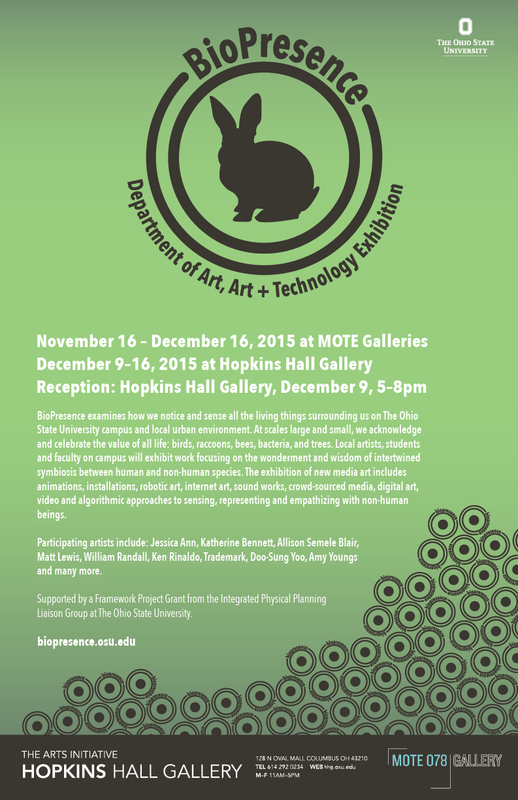 A flyer for the BioPresence gallery event where Professor Youngs’ STRIKE piece will be displayed. While many of the animals documented for the Biopresence project are reported as alive, others are found dead due to the window collisions. Windows can pose a very large hazard to birds. According to the Bird Conservation Network’s website, it is estimated that windows kill at least 100,000,000 birds each year. Ornithologists have followed this trend for decades and have concluded that birds simply can’t recognize glass as a barrier. In the Tetrapod Collection, we understand the effects of window kills very well. “A portion of our specimen donations are the result of window kills,” says Tetrapod Collection Manager Stephanie Malinich. However, this danger to birds has not gone unnoticed and has prompted local movements nationwide. Ohio Lights Out is a project that seeks to reduce the amount of light produced by buildings during migratory seasons. Ohio Lights Out has specific goals and methods for each major city in Ohio that would seek to make migratory routes safer for birds by having certain buildings enroll in the program. Enrolled buildings take a pledge that, during the migration season, they will reduce the number of lights left on at night. 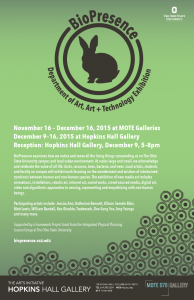 Amy Youngs’ project will be on display at the BioPresence Art exhibition, which takes place in the Hopkins Hall gallery on December 9th 2015 from 5pm to 8pm. Her project will be facing south in the second story windows. When choosing a species for the month of December, an obvious choice came to mind: Reindeer. However, writing about the Reindeer would be supporting a Christmas cliché and not everyone celebrates the holidays in the same way. So I decided to choose an animal that better represents the advent of winter and the calming beauty that this time of the year brings. With a wingspan of about five feet, the Snowy Owl (Bubo scandiacus) is a beautiful and iconic bird that is not often seen around Ohio. During the summer, they can only be found above the Arctic Circle where they hunt prey such as ptarmigan, waterfowl, and lemmings. The only time you are likely to see one of these owls is during the winter when they often move south to northern states of the U.S. such as Ohio, New York, and Colorado. 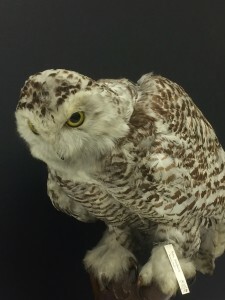 We have a few Snowy Owl specimens here in the museum, all of which have been collected in Ohio. Among them is the almost famous Snowy Owl from Hardin County in 2012. You may have seen this owl yourself since it stayed in place for several weeks or read about it in the Columbus Dispatch. Unlike most owls, Snowys, as birders lovingly refer to them, are diurnal (meaning that they’re active during the day. The Arctic Circle has 24-hour sunlight during the summer, and these birds have adapted to such conditions. Because these owls live in very cold temperatures, they have developed a bulky body with dense feathering especially on their legs; thus, these birds are the heaviest owls in North America. Unlike most owl species, Snowy Owls nest on the ground and have a tendency to sit in one place for hours on end to the point where they can become invisible against a snowy backdrop. Male Snowy Owls have a very unique courtship that involves flapping their wings in a “V” formation, and dropping a prey item in front of the female for her consumption. While they appear to be peaceful and calm, Snowy Owls will vigorously defend their territory against other species and some individuals have even been recorded attacking Arctic Wolves. To learn more about an owl’s biology one can search for pellets that these birds regurgitate which contain leftovers of the last meal, such as bones, hair and teeth. Learn more about dissecting owl pellets through this video. If you’d like to learn more general facts about Snowy Owls, feel free to visit the Cornell Lab of Ornithology’s page on them. One of the Snowy Owl’s more remarkable feats is that it has been recorded to be able to hunt up to 1,600 lemmings in a single year. In an environment as barren as the Arctic Tundra, one would think that at this rate of hunting, the lemming population would be seriously affected. Yet scientists have never been able to conclusively prove the link between heavy predation of aerial predators such as the Snowy Owl, and the lemmings’ population fluctuation. However, a recent study by Therrien et. al (2014) shows, for the first time, that relentless predation by aerial predators can play an important role in the cyclic depression in lemming population during the warmer periods on the tundra. The study also found that breeding populations of arctic avian predators increased vastly as a result of high lemming population densities. And it is in those years of abundance that young Snowy Owls often move far south in search of food. This fall Snowy Owls have already been sighted as far south as Illinois. Whether you celebrate any of the winter holidays or enjoy the oncoming winter, the Snowy Owl is a beautiful bird whose presence can add to the spirit of the season and the tranquility this time of year brings. From all of us at the Tetrapod Collection, we wish you a very Happy Holiday Season! From the massive wingspan of the American White Pelican to the incredible size of the Eastern Hellbender, recently the focus has been on very large specimens from the Tetrapod Collection. So for this month’s post, I’d like to write about one more giant specimen we have and end the trilogy of the colossal species. With an average length of seven feet and an average weight of 2,000 pounds, the Leatherback Sea Turtle (Dermochelys coriacea) is the largest species of turtle on the planet. Leatherbacks are believed to have the widest global distribution of any vertebrate, meaning they can be found in any of the world’s temperate oceans. Like most other sea turtles, leatherbacks feast on soft bodied organisms such as jellyfish, squid, blue-green algae, etc… One unique trait of the Leatherback Sea Turtle is that it has the ability to maintain warm body temperatures in cold water. Reptiles are famously “cold-blooded” and can only heat up their bodies using their surroundings. However, Leatherback Sea Turtles seem to be able to generate and maintain their own body heat through adaptations such as their large body size, changes in blood flow and a thick layer of fat. The leatherback is the only sea turtle species that doesn’t have a hard bony shell. A leatherback’s top shell (carapace) consists of leathery, oil-saturated connective tissue that is almost rubbery to the touch. Even after decades of storage at the museum, oils are still leaking from the carapace of our specimen. For more general facts about the Leatherback Sea Turtle, visit the National Geographic’s website . However, a paper by Lewison, Freeman and Crowder (2004) discusses another reason for the turtle’s decline. When fishermen throw out their nets in hopes of catching fish such as sardines or mackerel, they often end up catching many other animals such as dolphins, sharks, and sea turtles by mistake. This is known as bycatch, and many times these other non-target species will see drastic reductions in population because of it. I know it may be hard to picture an animal as massive as the Leatherback Sea Turtle getting caught in these nets, but these are very large nets that are often used for large groups of fish. When a turtle becomes entangled in the net, they can drown or suffer external injuries while struggling to get out. This study aimed to determine what effect bycatch has on leatherback numbers and what they found was shocking. According to their research, 50,000 leatherback sea turtles were caught as bycatch in the year 2000. This research and other investigations like it, have led to some new policies regarding the use of drift nets. According to the American Bird Conservancy, Russia has banned the use of drift nets due to the harm they cause to seabirds, marine mammals and other aquatic species such as sea turtles. 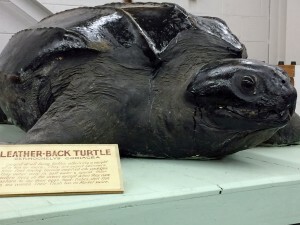 As I had mentioned earlier, all sea turtle species are endangered and the Leatherback is no exception. This phenomenon of bycatch illustrates how much damage commercial fishing can do to the oceans’ ecosystems and how we should think of ways to alleviate this problem. There has already been much success in reducing bycatch by using specially designed nets that help free any turtles that become ensnared, and many fishermen have begun to employ these nets in their everyday work. These animals are unique due to their immense size and awe-inspiring presence, to lose them would be a major defeat for conservationists worldwide. Lewison R. L., Freeman S. A., Crowder L. B. 2004 Quantifying the Effects of Fisheries on Threatened Species: The Impact of Pelagic Longlines on Loggerhead and Leatherback Sea Turtles. Ecology Letters 7, 221-231. Thank you for taking an interest in the Tetrapod Collection and what we do here. Just like the collection itself, our blog is always growing. Recently we’ve had many stories to tell and new, exciting topics to write about. Today I will announce a name change of the blog and give you some reasoning why we decided to do this. 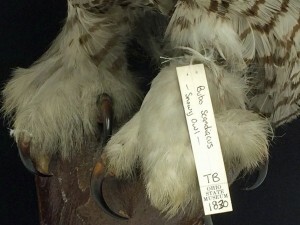 You may be familiar with blogs of other natural history collections and their catchy names. Among our collections at the OSU Museum of Biological Diversity the insect collection has a very timely blog that is aptly named ”The Pinning Block.” A pinning block is a surface where preserved insects are pinned down, so having a blog named after something that the insect collection uses daily is a great way to attract interest. So I have been thinking about what we do in the Tetrapod Collection and how we can put this into the blog’s name. It turned out to be a challenging exercise: The Tetrapod Collection holds about 4,800 amphibians, 2,300 reptiles, 17,000 birds, and 5,200 mammals; in addition to this we house many preserved bird eggs, nests and skeletons. Not to mention, many of the specimens have historical value due to them dating back to the late 1800’s. 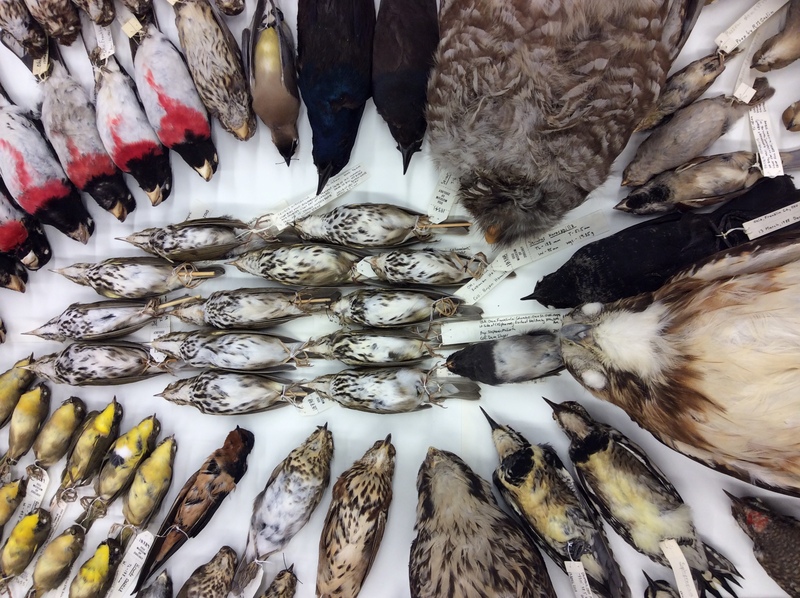 And if that weren’t enough, we also have preserved specimens from three extinct species of birds. Not to brag, but our collection is pretty impressive and deserves an awesome blog to go with it. But what is the unifying feature of this collection? Let us know what you think about the new name and share it with colleagues, friends, and family. Under our new and catchier name, we will continue to post about on goings and news in the collection. Most of the amphibian species in the Tetrapod Collection are preserved in jars and, since the specimens are rather small, many of these jars aren’t very big. For something like a frog or a toad, a large jar isn’t really needed. However, there is one species of amphibian that is so massive, we need to use our biggest jars in order to contain it. If you like amphibians, you may want to read on. from 25 to 60 years! With that kind of lifespan, the Eastern Hellbender can probably outlive most of your pets. Just like their name implies, the Eastern Hellbender is found throughout the eastern U.S. with a few populations in the southern end of Ohio. They are aquatic amphibians that can be found under large stones in rocky riverbeds where there is an abundance of their favorite food item, crayfish. They have wrinkly brown skin, which is often used by observers to distinguish them from their closely related cousins, the Mudpuppy. For more general facts about the Eastern Hellbender, visit the Ohio Amphibians website. never seen one in the wild (if you have, then I truly envy you). Well in, addition to being nocturnal, these salamanders have become rather rare. While there has been some recent improvement, the population of hellbenders has been steadily declining in the last few decades. Threats such as pollution of rivers, disease, and stocking of game fish, have reduced the Eastern Hellbender’s numbers noticeably. So as I’m sure you can imagine, finding an animal for research is very difficult. According to a recent paper by Olsen et. al (2012), eDNA methods could prove useful in finding hellbenders for study. The idea behind Environmental DNA (or eDNA) is that, by analyzing a sample of water or soil, you will be able to determine what species are in the area. In this study, Olsen et. al were able to detect Eastern Hellbenders by using the eDNA method on samples of water from rivers where these animals may be found. This opens up a whole new set of possibilities for scientific research since this method can make finding specimens much easier. To learn more about Olsen, Briggler, and Williams’ study, please click here. It’s easy to see why these salamanders got the name hellbender. Thanks to their massive size, amazing longevity, and rarity in the wild, the Eastern Hellbender has earned a place in the hearts and minds of many naturalists; and if we keep our rivers and streams clean, we can ensure this will be true for many years to come. “Ohio’s Hellbender Population Set Up for Success.” Ohio Department of Natural Resources. N.p., 09 Oct. 2014. How do mammals survive our cold winters?